SINGAPORE, August 14th, 2017 – According to the newly released IDC Worldwide Commercial Robotics Spending Guide , Asia Pacific spending on robotics (including drones) and related services is estimated to reach $66 billion in 2017. IDC expects robotics spending to accelerate over the five-year forecast period of 2017-2021, reaching $162 billion in 2021 with a compounded annual growth rate (CAGR) of 25.2%. This represents over 70% of the world's total robotics market in 2021. This new robotics spending guide now includes data on commercial and consumer purchases of drones and after-market drone hardware in addition to spending data on robotic systems, system hardware, software, robotics-related services, and after-market robotics hardware. "The convergence of robotics and artificial intelligence technologies are accelerating the development of the next generation of intelligent robots for industrial, commercial, and consumer applications," said Dr. Jing Bing Zhang, Research Director of Robotics at IDC Manufacturing Insights. "Intelligent robots with innovative capabilities such as cognitive interaction, self-diagnosis, and learning are emerging and driving wider adoption of robotics in many industries including manufacturing, resources, healthcare, retail, and so on." 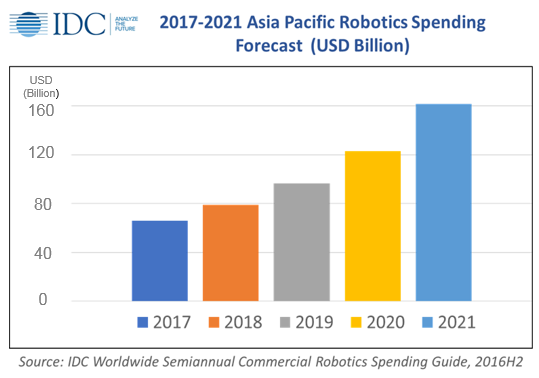 China dominates the Asia Pacific robotics market, with spending on robotics and related services expected to reach $74 billion in 2021. This represents 45.7% of Asia Pacific's total spending in the next five years. From a technology perspective, Asia Pacific spending on robotic systems is expected to grow to $92 billion in 2021.This includes industrial, service and consumer robots and after-market robotic hardware. Meanwhile, services-related spending, which encompasses application management, education and training, hardware deployment, system integration, and consulting, will grow to over $44 billion in 2021.